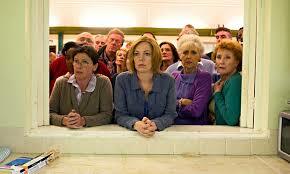 London Road is an extraordinary film. Although clearly indebted to its theatrical roots, this is a truly cinematic work – and quite unlike anything I have seen before. 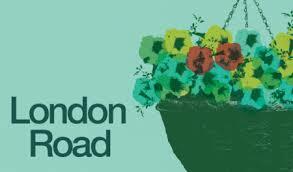 Centred around the infamous Ipswich murders of 2006, when five prostitutes were killed over the course of a few months, London Road tells the stories of the local residents: their discomfort at their street becoming part of the red-light district; their horror at the murders; their reactions to the revelation that the killer was Steven Wright, a neighbour of theirs. Through verbatim accounts, drawn from interviews conducted with the real life residents of the street , we learn of a community torn apart – and then, ultimately, uniting to reclaim its heart. Actually, it’s not really a musical, as such, but it is mostly sung – and the effect is stunning. The dialogue is faithfully reproduced, with every ‘um’ and ‘ah’ included; every hesitation, interruption, exclamation rigorously documented in the lines. The language dictates the rhythms, and the score stretches and amplifies the natural cadences of speech, creating a kind of hyper-realism that is utterly compelling. Some lines are repeated to create a kind of chorus or refrain, thus reinforcing some of the more prevalent ideas (‘He could be one of us…’). There’s no driving narrative here, no one character whose tale defines the story. It’s exactly what you might imagine a series of interviews to amount to: a collage of disparate accounts. And yet, this collage serves to create a very clear whole picture. There are conflicting emotions, as the prostitutes move away from the area to somewhere where they feel safer, and the residents begin to take a pride in where they live again. ‘I know it’s awful,’ says Julie (Olivia Colman), as she looks around the resurgent neighbourhood, ‘but I’d like to shake his hand.’ It’s an uncomfortable truth, made more so by the brooding presence of Vicky (Kate Fleetwood) walking through the street, untouched and unobserved, clutching a balloon like a hopeful child. No one can condone the murder of these troubled women, but none of us would like them working where we live. There are some big names attached to this film: Tom Hardy makes a fleeting appearance as a taxi driver obsessed with serial killers. But it doesn’t feel right to single anyone out: this is an ensemble performance, with all parts contributing fully to the whole. It’s a game-changer, I think.